But I don’t think I knew just how substantial that “experience” was until reading What Ever Happened to Orson Welles?. McBride wrote of his experience of working with Welles on The Other Side of the Wind in the final chapter of the earlier Orson Welles, a chapter devoted to that very project. In Wind, McBride played a film critic named Mister Pister (a character described by McBride in the new book as being “a comically exaggerated version of myself” (p. xiv), which is really rather unfair – on the basis of McBride’s description of this character, I don’t think Mister Pister could have ever written a book this good!). But in What Ever Happened to Orson Welles?, McBride devotes considerable space to detailing his complex relationship with Welles, beginning with their common Wisconsin background and the inspiration McBride drew from viewing Citizen Kane (1941) and Chimes at Midnight (1965), continuing with the writing and publication of McBride’s first book on Welles, and culminating in many ways with their meeting in 1970. It was then that Welles decided to cast McBride in Wind. But because the shooting of Wind took place over the course of approximately six years, McBride came to really know Welles (that said, he estimates that he shot scenes for his role for only 45 days over that six year span.) Their friendship was sometimes thorny, and the two clashed when they discussed politics, current events, and several of McBride’s various early screenplays. McBride writes that all of this allowed him to see the director “more clearly, with less hero worship” (p. 161), and indeed this book is to be commended for not attempting to sugercoat Welles as a human being. McBride may in some ways be a “partisan”, as Rosenbaum wrote, but only when it comes to Welles’ work. Despite these tensions, when it came to appearing in The Other Side of the Wind, McBride reports that he eventually adopted John Huston’s way of thinking; Huston played the main role in Wind, and described making the film as “a lark” (p. 171), as McBride eventually did…some four years into shooting! All of this on-set reporting alone makes for a highly interesting and informative read. Although the making of Wind took place 30-odd years ago, McBride’s account of that film – the players, the crew, the behind-the-scenes goings-on, and even specific scenes – is filled with detail; it is the next best thing to a behind-the-scenes documentary. But what really makes this material fascinating is the way – as Rosenbaum wrote about McBride’s Orson Welles – that it informs McBride’s outstanding critical analysis of Welles’ films, particularly films similar to The Other Side of the Wind: films which Welles made independently, completely outside of the Hollywood system. Even the seemingly anecdotal material surrounding Welles’ treatment of McBride on set is connected by McBride to larger points he makes about Welles’ direction of actors (and non-actors such as McBride) over the course of his career, something McBride does in other instances throughout the book. 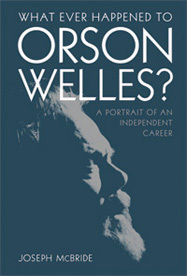 This is McBride’s third book on Orson Welles. Each has its own place on the shelf of a Welles fan: what What Ever Happened to Orson Welles? gives us is a case for Welles’ “independent career”, which stretches back decades before The Other Side of the Wind. This is truly an exhaustive book. Superbly and carefully researched, as are all of McBride’s 15 books, I was just as often surprised by a new piece of information about Welles or one of his films as I was amused and bemused by McBride’s account of making a movie with a cinema legend. As a postscript, a word should be said about Gary Graver, the cinematographer with whom Welles worked on The Other Side of the Wind and many other projects. What Ever Happened to Orson Welles? is the first book in English to study this collaboration in the depth that it warrants; indeed, McBride recently remarked in an interview that the book is “almost as much about Gary as it is about Orson.” (3) That says something about how important the Welles-Graver collaboration was. Tragically, Graver died at the age of 68 this past November. What Ever Happened to Orson Welles? A Portrait of an Independent Career, by Joseph McBride, The University Press of Kentucky, Lexington, KY, 2006. Joseph McBride, Orson Welles, revised and expanded edition, Da Capo Press, Cambridge, MA, 1996 (first published 1972). Jonathan Rosenbaum, “The Battle over Orson Welles”, Cineaste, vol. 22, no. 3, 1996, pp. 6-10, collected in Rosenbaum, Essential Cinema: On the Necessity of Film Canons, The Johns Hopkins University Press, Baltimore, 2004, p. 379. See Damien Love, “Inherit the Wind”, Bright Lights Film Journal, no. 55, February, 2007. Peter Tonguette is the author of Orson Welles Remembered and The Films of James Bridges. His work has appeared in Sight & Sound, Cineaste, Film Comment, and many other publications.